BIG Size BBBBiscuits contain enough T.H.C to provide a Body Stone that lasts for 3 - 6 hours. 2 more-ish flavours, Cinnamon and Choc Chip. BBBBoth are guaranteed to be at least 4 & 20% cheaper and 4 & 20% bigger than any other cannabis cookie for sale in the streets of Nimbin. The effects of cannabis come on slowly and then are noticeable for three to six hours depending on the users metabolism. 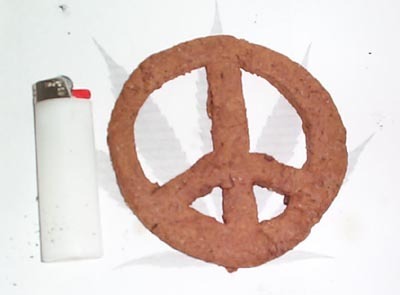 When using cannabis cookies for the first time, we recommend a self experimentation process whereby you eat half a BIG Biscuit (or 1/8th of a F*#%ing Huge BBBBiscuit) and then wait about 1 hour to gauge the effects. If you feel you want more after that time, eat some more. 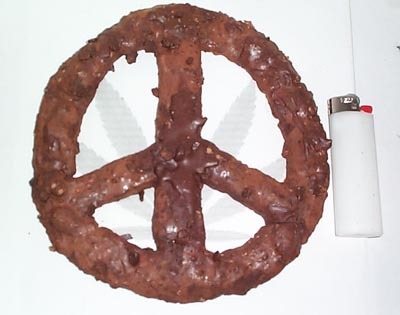 Eating a F*#%ing Huge BBBBiscuit in a single session will definitely induce THC OVER LOAD and you will spend several hours absolutely horizontal with an upset stomach, berating your self for acting irresponsibly, because eating too much cannabis can lead to heightened euphoric effects, confusion and, for some people panic. If change makes you anxious, withdrawn or insecure, it is especially important to take care with your cannabis intake. Have a friend you can trust with you when you first try cannabis cookies. Deep breathing and a drink of orange juice or other vitamin C enriched drink should relieve any symptoms of panic which might arise.